Today is a swishy hair day. Every time I do it I get a delicious waft of the new perfumed hair conditioner from Lush, called Happy Happy Joy Joy. It’s definitely living up to its name. They’re good with appropriate names, are Lush, and today’s giveaway is a case in point. To help celebrate the site’s second birthday, two lucky readers will win the Celebrate gift set (worth €29.95 each), a celebratory box filled with five fabulous foaming goodies. 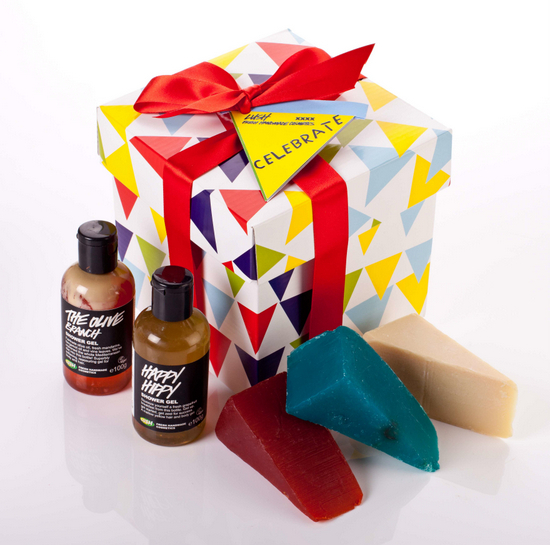 Inside the box you’ll find two zesty shower gels – Happy Happy and The Olive Branch – along with three triangles of gorgeous Lush soaps: Karma, Honey I Washed the Kids and Sea Vegetable. This one is open in Ireland and the UK; just complete the simple steps below. Good luck! I'm embarrassed to say I've never tried any lush products so fingers crossed! I adore Lush what they represent not to mention the quality of their products and sweet packaging. Would love to win this Lush prize! Have only every tried 1 or 2 things from Lush. Would love to try more!! oh wow such a nice prize! Gorgeous prize. Whenever I get within smelling distance of Lush, I'm drawn to it! Oh Honey I Washed The Kids is one Lush soap I've always wanted to try! Ooo eee!! Love the Lush range, this is a darling prize! What lovely and natural products! Good luck to everyone! Love the sound of these! I love the Lush Christmas sets, and Honey I washed the kids has been a stocking stuffer favourite of mine for years! The scent is adddictive! Would love this, brill prize! I want to have a swishy hair day too! Gotta love a Lush giveaway. Lovely prize, great pick me up for a dreary rainy day like today! Karma is a really yummy soap. Thanks for the giveaway! would love to win! LOVe Lush! I'd love to win this please. Thanks! Have never tried Lush so I'm intrigued!! Lovely giveaway, I've gone a bit mad for Lush lately! would love love love to win this prize! Lush stuff is gorgeous. Lovely giveaway. I'm completely bonkers about every single thing Lush makes, but since my budget never stretches that far, I never get to buy any for myself. :-( But I do buy their yummy things for other people, and that's nearly as much fun. :-) I would love to win this. Though I might just give it away again! Love this! im obsessed with Lush! !